As the only engineer in your spaceship, you must fend off hordes of alien scum by setting up defenses all over the ship! It's one man against an army! 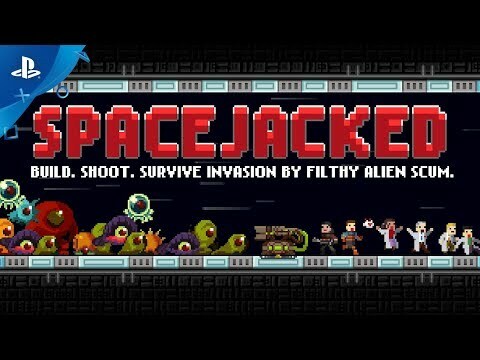 Spacejacked is a super fast-paced ACTION TOWER-DEFENSE. Play as Dave, a lone technician tasked with protecting his spaceship from being overrun by aliens while it prepares to warp into hyperspace. Players who seek to experience a blend of action shooter and tower defense will enjoy this game! Experience crazy-fast navigation between arenas via gravity flipping and teleporters as you defend multiple arenas simultaneously. Play through the Story Mode filled with quirky characters over the course of two major story arcs. Enjoy the even faster-paced Endless Mode and compete for high scores with friends.